We welcome tour groups at Shooting Star with advance notice. 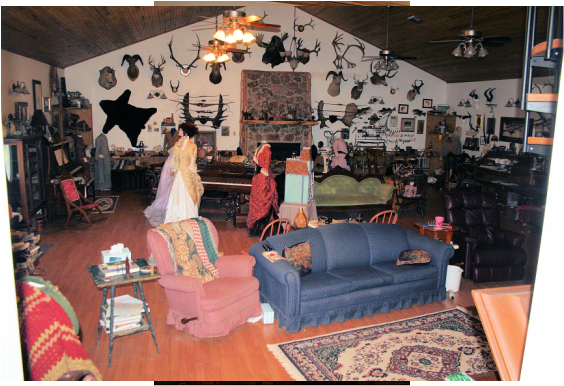 We have a large great room filled with museum displays. Spring is a great time to schedule a "chuckwagon" dinner over the open firepit in our backyard. Visit with the Natural colored sheep, Rowdy the longhorn steer, and the bunnies. Arrange for an afternoon of croquet, a Victorian tea, a special class on leatherwork, or Victorian clothing or millinery or more. We know the Victorian era well- any of our lectures or classes can be incorporated- or just a tour of the museum and our special old fashioned cooking may be just what you needed. Groups rave over our old fashioned bread pudding, molasses cookies, and jelly cookies.